Wish "A Happy Diwali" by sending this Auspicious Collection of Unique Celebration Gifts to your near and dear ones. 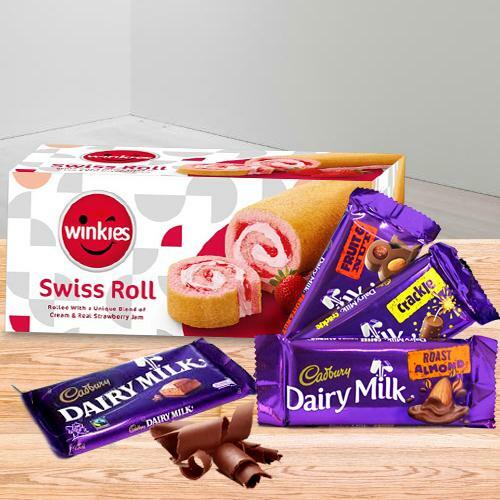 This Gifts Collection is arranged with a Scented Candle Set, Cadbury Dairy Milk Chocolates, Cadbury Dairy Milk Crackle Chocolate, Cadbury Dairy Milk Fruit and Nut Chocolate, Cadbury Dairy Milk Roast Almond Chocolate and Winkies Swiss Roll - Cream and Real Strawberry Jam (185Gm). Flowers Delivery Kota, Send sweets Anantpur, Wedding Cake Allahabad, Diwali Mithai Tirumala, Send Flowers and Gifts to Hapur, Online Shop Goa, Flower to Tellicherri, New Year Flowers Nagaur , Fresh Fruits Rourkella, Send Gift Kannur, Dry Fruits to Buldhana, Birthday Delivery Gaziabad, Sending to Udumelpet, Flower shop Meerut, Virudhunagar Online Cake Delivery.